Viva CookeVegas: Another Weekend Update. Wow, just when I thought my life could not be any more mundane........ hee hee! Saturday was filled with the soccer jamboree and me debating whether I should have Michael try out for the traveling team. Sunday involved a fun filled morning at church (heavy sarcasm,nothing personal), having a Mexican lunch at El Tapitio, followed by a movie screening with 8 people for G.I. Joe with the Nelson clan and Michaeal/Mom (meaning me). I LOVE the Nelson's. 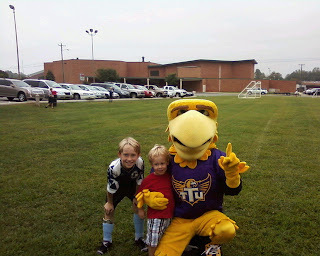 Anywho, here is a picture of my two favorite dudes with Awesome Eagle from TTU. Go Tech!!!! Just FYI....the Eagle mascot is truly awesome. Last week was the kick off of Cougar Run (yes, it is back again) and your truly is on the board.... I had to sit/stand through 5 pep rallies (one for each grade ) featuring the Tech cheerleaders and Awesome Eagle taking pictures with every grade at Michael's school. It is bittersweet......last year at Capshaw! Go Cougars! We raised over 50,000 gross last year, hopefully this year will prove just as fruitful. TTU PRIDE!!!!!!!!!!! I missed you at the soccer festivities. HMJ was so not interested- we ended up running laps around the field.